‘Khichuri’ is the common Bengali name of a mixture of rice, lentil or pulse and other ingredients, which are cooked together. 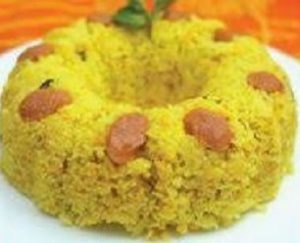 Though khichuri recipe is one of the easiest and simplest recipes, yet it is a very popular food item, particularly to many Bengali-speaking people of Bangladesh and North-Eastern India. Or you can say that they like to eat this menu when they like to enjoy a free time at home. 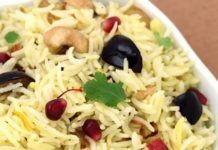 At times, when they don’t want to cook a number of different dishes of rice and vegetable, they just mix all ingredients together and cook one recipe. That is the vegetable khichuri, nothing else. The taste and flavor of khichuri are dependent on the quality of rice, lentils, and vegetables. Though the primary ingredients of khichuri recipe are rice and lentils, it is the vegetables that make the difference. Usually, during winter, availability of different winter vegetables encourages to be more creative about the vegetable mixed khichuri. Cooking of vegetable mixed khichuri is so simple that you can try for it even after reading the simple process. It is just mixing of rice with lentils (better to add at least 2 types) and 3-4 different types of vegetables. It hardly needs any other extra curry as a side dish. Yet someone might like to take some slices of onions or a spoon of ghee (clarified butter) or mustard oil to give more flavor and pungent. I saw in many countries they cook this rice but called this recipe “yellow rice”. Mix rice and all lentils and wash with water. Keep aside for rinse water. Heat oil in a nonstick deep sauce pan on the burner. When the oil is hot enough, add all spices to the oil. First, add carrot and cook lightly. Then add one by one other vegetable and cook lightly. After about 5 minutes add rice and lentil mix. Fry the rice and vegetable mixture for 3 minutes. After stirring with spice, add 8 and1/2 cups water (double then, pulses and vegetables). Cover with a lid and cook for about 10 minutes over high heat and 10 minutes over medium heat or till the water dries up. Switch off the burner. Keep the vegetable khichuri over the burner with the lid on for another 5-10 minutes. Take the yellow rice in a dish. Your delicious vegetable mixed khichuri is ready to be served. 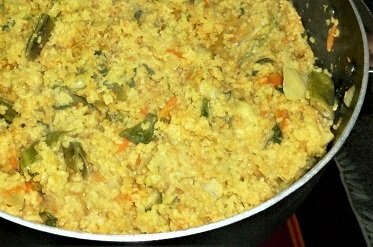 Serve the vegetable khichuri recipe with beef curry or simply serve with egg fry or eggplant fry and any kind of sour pickle. This recipe is perfect for rainy, cloudy, and winter weather. If you like my vegetable khichuri recipe please share this recipe with your family and friends.